The "giving away" of the bride by her father may be an antiquated tradition, but it still a beautiful one and makes everyone (including the photographers!) emotional on the wedding day! The processional is one of the most important times of the day to document because there are so many different things to photograph: the walk down the aisle from the back, capturing the bride's train, the reaction of the groom when he sees the bride, the parents' expressions, and more! We like to say we are doing the ceremony dance during this time as we are both circling the area, making sure we each shoot separate and different moment. We want to get the traditional documentary shots as well as being open to seeing opportunities to capture something in unique way. We are also very careful to move quietly and unobtrusively and to be aware of each other & videographers if present. All the time as well being cognizant of the actions and expressions of the couple and their families. I love the look on everyone's face in this image; everyone is fully engaged and in the moment. 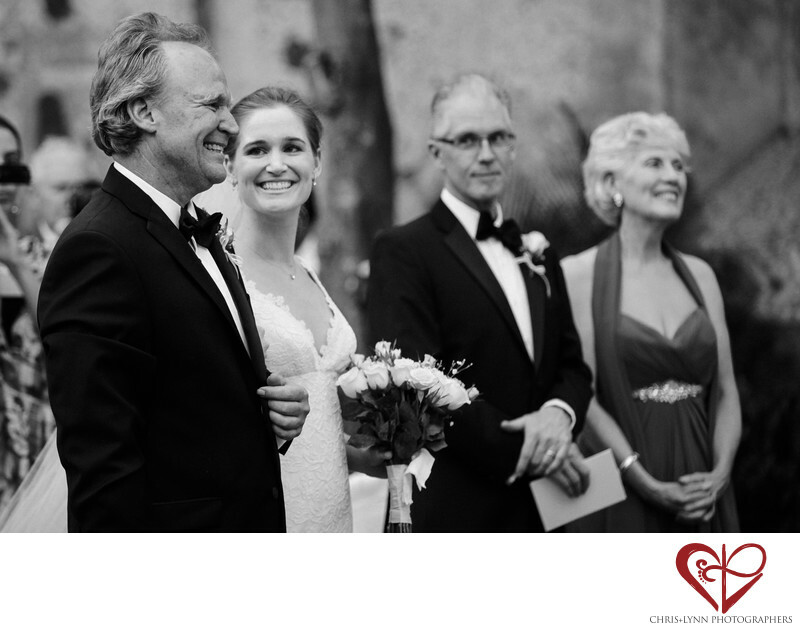 The bittsweet smile of the father of the bride, her loving smile at him, and the groom's parents' expressions each tell a story - and that is really what our job as wedding photographers is: storytellers. Location: Carretera Federal Cuernavaca- Cuautla Km 32.5, Cocoyoc Centro, 62736 Yautepec, MOR, Mexico Hotel Hacienda Cocoyoc,. 1/200; f/2.8; ISO 1600; 135.0 mm.